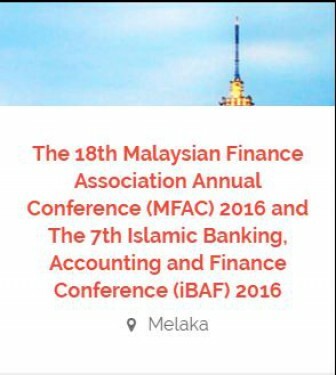 The 18th Malaysian Finance Association Annual Conference (MFAC) 2016 and The 7th Islamic Banking, Accounting and Finance Conference (iBAF) 2016 is organized to provide a platform for researchers, practitioners, policy makers and postgraduates to discuss research ideas pertaining issues in commercial and social welfare sectors. The Conference will be held from 29th to 31st May 2016, in Equatorial Hotel Melaka, Malaysia, under the theme “Towards a Vibrant Social Finance for a Sustainable Banking and Financial System”. The conference committee cordially invites submission of both theoretical and empirical papers for presentation at the conference and the PhD colloquium. Islamic Finance TV © copyright 2019 IFTV. All rights reserved.